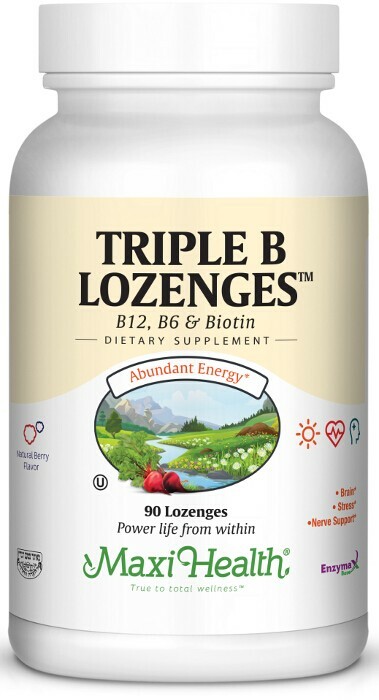 Triple B Lozenges™ are a combination of vitamin B-12, vitamin B-6 and biotin. It supports function and maintenance of the nervous system, blood cells, and protein. Vitamin B-12 is essential for healthy nerve cells. It is a key micronutrient that supports lymphocyte cell fuction. B6 (pyridoxine HCl 96.6%) known as the master vitamin, is used to process the amino acids that help build proteins and hormones. “B” wise! “B” Healthy! Get Maxi Triple B Lozenges™! Take one (1) tablet, one to five times daily, or as directed. Dissolve in mouth, upon arising, or as directed. Other Ingredients: Sorbitol, modified cellulose gum, microcrystalline cellulose, vegetable magnesium stearate, Enzymax® (calcium carbonate, bromelain, papain, lipase, amylase, protease, silica), natural berry flavor, beet juice powder, stearic acid. I usually like to apply B12 patches but Triple B lozenges are tasty and they help my energy level and numbness.